If I were asked to pick one thing that I like about Europe, I answer would probably be something about the small/ unnoticed side streets that Europe has to offer. 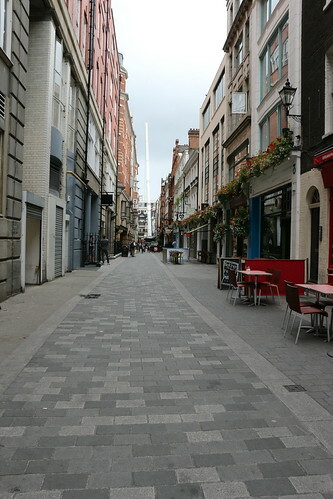 Much different compared to home, these streets aren’t concrete based, brick or stone instead. And sometimes, hidden gems are found. 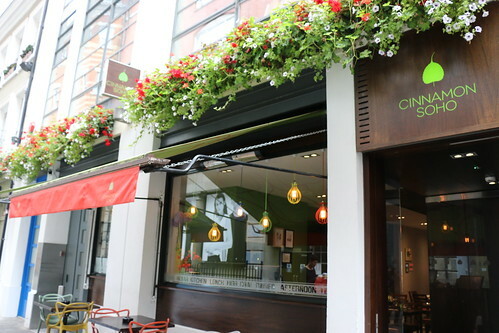 We went to Cinnamon Soho for a Sunday lunch (I had done my research on Indian restaurants prior to our trip. If I remember correctly, ). If I had known, I wouldn’t have went on a Sunday. This is because they have a limited menu on Sunday and there were items on the regular menu that we wanted to try. I don’t know if people were out and about, but it was really quiet when we were seated for lunch. Only two other guests came in, during the time that we ate there. Dad and D ordered the same starters, so the restaurant put double the starters on one plate. 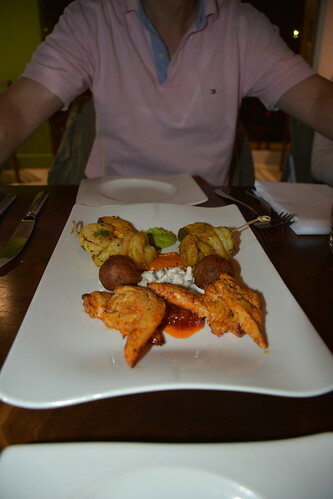 It consisted of an arrangement of assorted kebabs (vegetable shikampur, stir fried shrimp, tandoori salmon, chicken tikka (copied this from the menu). 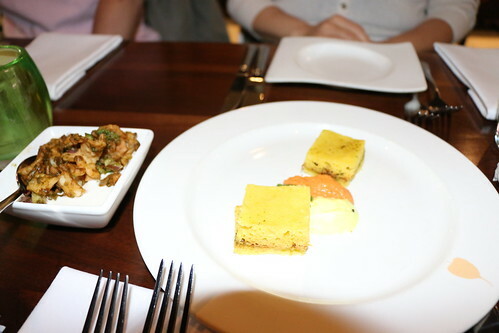 Mom and I had the same appetizers; papdi chaat, seared potato cake, steamed chickpea cake and homemade chutneys (copied from the menu). Everything was new to me. There wasn’t much (as you can see from the pictures) and I haven’t heard of these foods before. They were quite delicious, to be honest, even though I had no idea what I was eating. Mom and dad had the same. Braised lamb (raan slow braised leg of lamb with saffron sauce; copied from the menu). 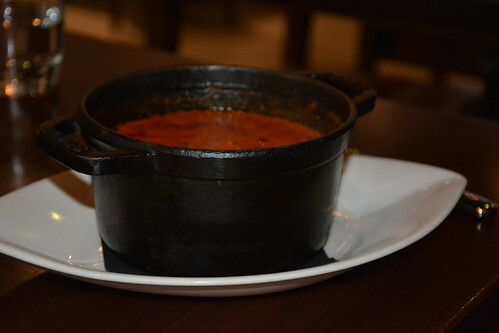 I had a vegetable handi (mixed vegetable ‘handi’ cooked in dum; copied from the menu). It was surprisingly good and a bit spicy. It came with rice and naan. 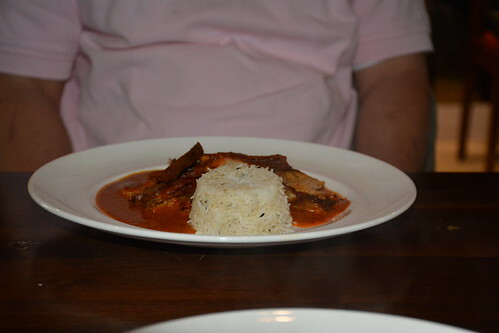 D had chicken curry (home-style chicken curry on the bone with ghee rice; copied from menu). 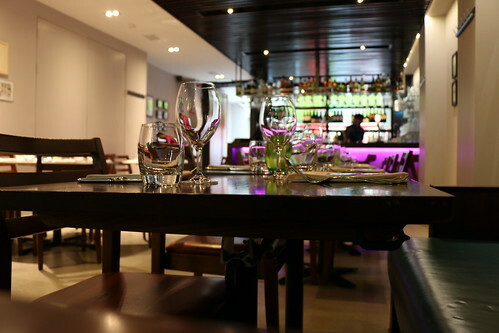 Originally the restaurant’s Sunday lunch comes with three courses. But after whispering to each other fir a while, the restaurant owner (I’m assuming) came and told us that we could either order an appetizer and main or a starter and main for £16 (three courses for £24) (click here for the Sunday menu). 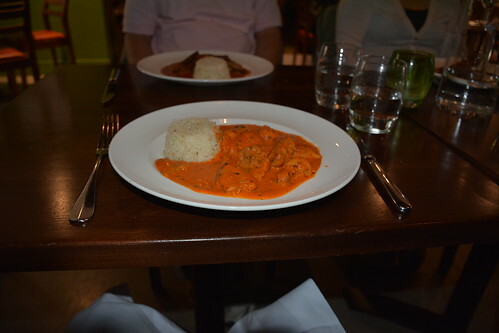 My research and reviews told me that Cinnamon Soho was one of the top ten Indian restaurants to go to in London. My verdict? It wasn’t what I expected it to be, the food was good, but something was missing. The websites to which I found Cinnamon Soho on was talking about the food like it was too good to be true. Click here to read my post about f&c.